THIS HAS A SURPRISINGLY SOPHISTICATED TASTE WHEN YOU CONSIDER THIS CHOCOLATE PUDDING TAKES 10 MINUTES TO MAKE. ITS GREAT WHEN YOU WANT SOMETHING INTENSELY CHOCOLATE HAVE NO TIME AND LOTS OF LEFTOVER BITS OF CHOCOLATE IN THE FRIDGE. IT PRODUCES A LOVELY TEXTURE THAT''S A BIT LIKE THICKENED GANACHE. 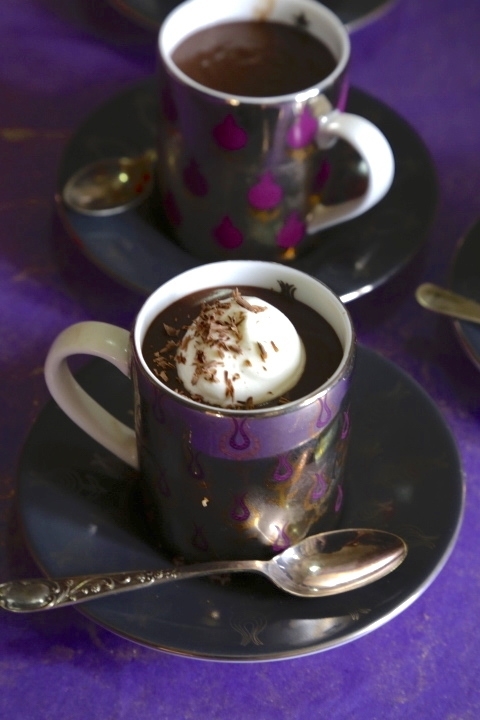 I USE ELEGANT ESPRESSO CUPS FOR THIS PUDDING AND TOP IT WITH WHIPPED CREAM, SHAVED CHOCOLATE AND SOMETIMES CARAMEL. COMBINE THE FIRST 3 INGREDIENTS IN A DOUBLE BOILER OR USE A MILK BOILER. 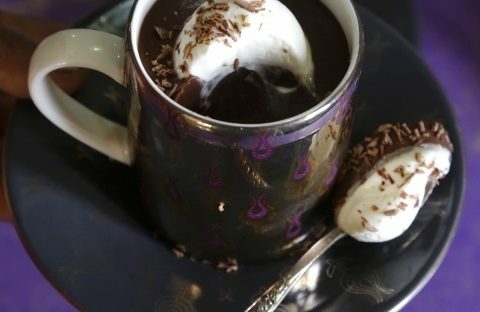 COOK ON A SLOW FLAME STIRRING CONSTANTLY UNTIL CHOCOLATE HAS JUST MELTED . SWITCH OFF FLAME AND KEEP STIRRING UNTIL MIXTURE IS SMOOTH. STIR IN THE BUTTER- IT WILL GIVE THE CHOCOLATE A NICE GLOSS. STRAIN THROUGH A FINE SIEVE TO REMOVE ANY BITS AND PIECES. STIR IN LIQUEUR IF USING. POUR INTO CUPS/SERVING BOWLS OF YOUR CHOICE. LEAVE ENOUGH SPACE FOR A TOPPING. COVER TIGHTLY WITH PLASTIC WRAP AND CHILL 4 HOURS. TOP WITH WHIPPED CREAM, CHOCOLATE SHAVINGS, HOMEMADE CARAMEL SAUCE, CANDIED NUTS, BRITTLE, WHITE CHOCOLATE GANACHE OR FLEUR DE SEL.